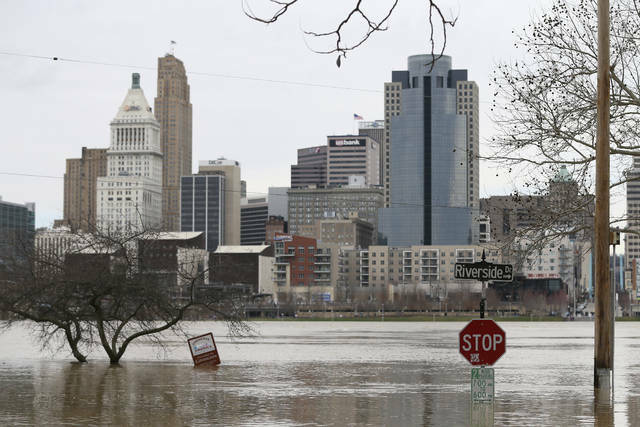 Heavy rains overnight have sent the swollen Ohio River at Cincinnati to its highest point in 20 years with the river expected to remain above flood stage through the end of the week, a National Weather Service meteorologist said Sunday, Feb. 25. Between 1.5 and 2.5 inches of rain fell across the region from Saturday night into early Sunday morning accompanied by damaging high winds and an unconfirmed report of a tornado in Brown County. Meteorologist Kristen Cassady said the Ohio River reached 60 feet (18.3 meters) Sunday morning at its Cincinnati recording station, 8 feet (2.4 meters) above flood stage, and could reach 60.6 feet (18.5 meters) sometime Sunday. It would be the highest recordings since 1997, when the river reached 64.7 feet (19.7 meters). The Cincinnati Enquirer has reported Cincinnati police had to rescue numerous drivers whose vehicles became trapped in flood waters. Local streams and rivers overflowing their banks have caused road closings throughout central and southern Ohio. Republican Gov. John Kasich issued an emergency declaration Saturday in 17 southern and eastern counties. Kasich in a briefing Sunday at the state’s emergency operations center said preparations by local and state officials ahead of heavy rains and expected flooding helped Ohio “dodge a bullet” with no loss of life reported to this point. Kasich pointed to his order five days ago to activate 40 soldiers from an Ohio National Guard engineering company to raise floodgates along the Ohio River in Portsmouth. The Ohio River is expected to begin slowly receding Sunday, but will likely to remain above flood stage until the end of the week, fed by its numerous tributaries, Cassady said. “The good news is the rain is done and we’ll have a couple of dry days for that water to recede,” she said. Another weather system is expected to bring rain during the middle of the week. Roughly 20 miles east of Cincinnati along the Ohio, more than 40 homes and businesses have been affected by flooding in low-lying portions of the village. Residents began evacuating Friday into Saturday. Rain forecast for later in the week will keep officials and emergency personnel in the village of around 2,600 people on high alert, he said. “We’re going to remain vigilant until the river gets back to where it belongs,” Roberts said. Ohio University in southeastern Ohio canceled classes for Monday because of concerns about potential flooding in the Hocking River. In Springfield Township in central Ohio’s Clark County, two donkeys had to be rescued from a field flooded with 4 feet (1.2 meters) of water, The Springfield News-Sun reported. Pike County in southern Ohio was preparing for flooding Sunday after the Scioto River rose 2 feet (.61 meters) above its 20-foot (6.1-meter) flood stage, according to The Chillicothe Gazette. COLUMBUS — As flood waters continue to recede, the State of Ohio Joint Information Center (JIC) is closing 12 p.m. today as the State’s Emergency Operations Center (EOC) transitions from partial activation to assessment and monitoring. The State JIC opened 10 a.m. Sunday, February 25, to support the EOC during the recent activation. The State will continue to support Ohio’s flooded counties as they move from a response mode into flood recovery. COLUMBUS – Ohio Department of Insurance Director Jillian Froment is providing insurance information to help Ohioans impacted by the recent severe weather with the recovery process. Damage caused by rain, hail, lightning, wind and tornado are generally covered by a standard homeowners insurance policy, renters insurance policy and an auto insurance policy’s “comprehensive” or “other than collision” coverage. Flood insurance is not included in a typical homeowners or renters insurance policy. It’s made available by the federal National Flood Insurance Program and purchased through an insurance agent. There is a 30-day waiting period for coverage to start. Immediately call your insurance agent or company. Take reasonable steps to prevent additional damage if permitted by public safety authorities. Closely inspect property and cars for damage. Note and photograph any damage. If required to seek temporary housing, check your policy for “loss of use” coverage. Be sure everything is considered in your claim. Back up claims with written estimates. Obtain a list of reputable contractors from your insurance carrier, the Better Business Bureau or a specialized consumer organization. Contact multiple contractors and obtain more than one estimate. Do not allow a contractor to inspect your property when you are not home. If you give a contractor permission to inspect your property, personally watch them conduct the inspection. Obtain, in writing, the terms and conditions of the project. Avoid signing a contract until the document is reviewed fully. Pay the contractor by check or credit card, rather than in cash, and do not pay in full until all work has been finished. Consumers with insurance questions can contact the Ohio Department of Insurance at 1-800-686-1526 and visit www.insurance.ohio.gov, which includes a severe weather recovery toolkit, for information. Ohio EMA Watch Office transitions from daily operations to assessment and monitoring of minor flooding in Ohio and starts providing regular situation awareness reports several times a day to federal, state and local partners and holding coordination calls with National Weather Service. Ohio National Guard successfully deploys City of Portsmouth install flood gates. Ohio Department of Natural Resource section reaches out to affected counties. Several county Emergency Operations Centers open. Flood defense water pumps provided to New Boston in Scioto County after their flood defense pumps failed. Ohio National Guard provides assistance to Scioto County with flood wall installation. Ohio EMA provides sand bags to Lawrence County. Governor Kasich issues proclamation declaring state of emergency in 17 counties. Ohio EMA transitions from assessment and monitoring to partial activation. State of Ohio Joint Information Center opens. ODNR sends liaisons to Scioto County Emergency Operations Center. COLUMBUS – Ohio has experienced steady rains and rising waters in the past week. The Ohio Department of Natural Resources (ODNR) urges Ohioans and visitors to avoid high, fast-moving water in rivers and streams as well as flooding at ODNR facilities statewide. Lakes, rivers and streams will remain high and swift moving, creating and concealing hazards. These conditions pose dangers for boaters, paddlers and anglers as well as visitors at our Ohio State Parks. High and fast stream currents, downed trees that act as “strainers,” undercut and eroded banks, debris and other underwater obstacles can be dangerous to people walking or boating in or near a waterway. ODNR recommends “scouting” a stream before launching a boat in an unfamiliar area. Boaters are urged to file a float plan with a responsible person. Capsizing or falling unexpectedly into high, fast water can be life-threatening. ODNR further advises Ohioans and visitors to properly wear a U.S. Coast Guard-approved life jacket while boating and when fishing in rivers, lakes or streams. More info on high water and flooding can be found at waterdata.usgs.gov. For conditions of Ohio State Parks, please visit their individual websites for updates – those can be accessed at parks.ohiodnr.gov. Ohio Attorney General Mike DeWine today (Feb. 27) offered consumer protection tips following the flooding and other severe weather that affected Ohio this weekend. Following severe weather, storm-chasing contractors may travel to affected communities to offer their services. In many cases, they visit consumers at their homes and claim they can complete the work immediately. They may ask for a large down payment or tell consumers to sign over their insurance checks, but ultimately they perform shoddy work or no work at all. Contractors who show up unexpectedly after a storm. Contractors with no reputation or a poor reputation. Requests for large upfront payments, such as half or more of the total cost. Requests for consumers to sign over their insurance check. Offers to begin work immediately. No written contract outlining the work to be done. Door-to-door sellers who don’t notify consumers about their cancellation rights. Research businesses carefully. Search for complaints on file with the Ohio Attorney General’s Office or Better Business Bureau, contact past customers, and search the names of the business and the individuals offering services. Don’t accept services from someone who refuses to provide proper identification. Check your insurance policy. Determine what coverage you have and what steps you should take. Get multiple estimates. For a large clean-up job, consider getting estimates from at least three different contractors. Be wary if one contractor quotes a price that is dramatically lower than the prices other businesses are offering. The contractor later may demand more money or fail to complete the work as promised. Don’t make large payments in advance. Be wary of contractors who demand large upfront payments, such as half or more of the total cost. Also be cautious of contractors who ask you to sign over your insurance check. Try to pay in increments, as the work is completed to your satisfaction. Get a written contract detailing the costs, the work to be done, the starting and end dates, and any verbal promises made by the contractor. Understand your cancellation rights. If the contract resulted from a door-to-door sale, you generally have three days to cancel the contract, according to Ohio’s Home Solicitation Sales Act. The seller should give you written notice of these rights. Consider paying with a credit card. Paying with a credit card generally gives consumers greater protections to dispute unauthorized charges, especially compared to paying in cash. After extensive flooding occurs, some flood-damaged vehicles ultimately may enter the market. For example, individuals may sell cars online without disclosing flood damage, or dealers may purchase cars at auction without realizing that they were damaged in a flood. Used-car buyers can help protect themselves by checking vehicle history reports using services such as the National Motor Vehicle Title Information System, CARFAX, and the National Insurance Crime Bureau. History checks may not show the complete background of a vehicle, so consumers also should have the vehicle evaluated by an independent mechanic before making a purchase. Stains or odors. Look in the trunk and pull up carpet to see if there is mold, rust, or odor. A musty smell is a strong indicator of water damage. Also, be aware of strong cleaning odors or air fresheners, as these scents can cover up musty odors. Dirt. Inspect areas of the car that may be hard to clean, such as the trunk, glove compartment, or dashboard. If you find dirt or rust in these hard-to-reach spots, the car may have been flooded. Brittle wires or electrical problems. Problems such as an ignition that does not start or lights that appear foggy or do not work may indicate water damage, especially in conjunction with brittle wires. Consumers who need help or who want to report a potential scam should contact the Ohio Attorney General’s Office at www.OhioProtects.org or 800-282-0515. Flooding of areas surrounding the Ohio River and its tributaries are expected into next week and could be significant. Small streams and lowland flooding is possible. A line of strong to severe storms may pose a damaging wind threat to the greater Cincinnati area Saturday night. “Flooding is one type of severe weather we can encounter in our state. Older Ohioans have a deep knowledge of the communities in which they live, and many have experienced flooding in the past. But every flooding event is different, and we want them to be prepared and know how to reach out for help when needed,” said Beverley Laubert, Interim Director of the Ohio Department of Aging. • Turn Around, Don’t Drown! is critical for all drivers to remember. • Avoid walking or driving through flood waters. • Do not drive over bridges that are over fast-moving floodwaters. Floodwaters can scour foundation material from around the footings and make the bridge unstable. • Just 6 inches of moving water can knock you down, and one foot of moving water can sweep your vehicle away. • Instructions for rescue personnel to help relocate safely and quickly in an emergency, such as the need for assistive devices (e.g., cane, walker, oxygen). • A backup supply of daily medicines and the means to store them properly. • A safe place to go if it becomes unsafe to stay in your home (e.g., public shelter, friend’s or neighbor’s house) and a plan for getting there. If shelters are set up to assist residents who need to leave their homes, information will be provided. Ohioans who know older adults are encouraged to check in on them to make sure they have these tips and assistance that they need. Isolation puts people at greater risk for problems during emergencies and working together as a community is especially important. The Department of Aging works with the state’s 12 area agencies on aging to make sure that each community has a plan for assisting older adults during weather emergencies. Your area agency can also help you identify resources, such as energy assistance, chore service and minor home repairs that can help you stay warm and safe this winter. Call 1-866-243-5678 to be connected to the agency serving your community. Follow the Ohio Department of Aging on Facebook and Twitter for more winter safety information and resources. The Department of Aging is a proud member of the Ohio Committee for Severe Weather Awareness, along with the Ohio Emergency Management Agency. Visit www.ema.ohio.gov for information on severe weather preparedness. For the most up-to-date weather conditions, visit www.weather.gov. About ODA – The Ohio Department of Aging works to ensure that our elders are respected as vital members of society who continue to grow, thrive and contribute. We collaborate with state agencies and community partners, including area agencies on aging, to help integrate aging needs into local plans and ensure that aging Ohioans have access to a wide array of high-quality services and supports that are person-centered in policy and practice. Our programs include the PASSPORT Medicaid waiver, caregiver support, the long-term care ombudsman program, the Golden Buckeye Card and more. Visit www.aging.ohio.gov. TOLEDO — The federal agency that keeps open shipping channels along Lake Erie has settled a long dispute with Ohio over what to do with sand, soil and mud scooped out of Cleveland’s harbor. What’s next for the state is getting rid of more than 1.2 million tons (1.1 million metric tons) of sediment dredged from seven other ports each year before a new law bans dumping it in the lake by the summer of 2020. Ohio’s Environmental Protection Agency convinced lawmakers last year that putting the sediment right back in the lake doesn’t make sense and could be contributing the toxic algae outbreaks in recent years, leading to the ban on dumping. Now the agency is coming up with alternative uses for the huge amounts of silt. Since the 1980s, the state EPA has wanted to stop the U.S. Army Corps of Engineers from dumping dredged sediment into the lake. Only the contaminated silt coming from the Cuyahoga River went into a contained disposal site. The issue flared up again a few years ago when the Army Corps proposed dumping sediment from Cleveland’s harbor offshore. That led to a legal battle settled this past week — the end result is sediment from Cleveland will continue to go into containment site and not into the lake. The feud forced both sides to look at whether there were better ways to use the sediment instead of dumping it into the lake or the containment site. State lawmakers approved spending $10 million to research alternative uses. Over the past two years, Cleveland has been filtering the sediment and using it in road projects and filling fill the basements of abandoned homes that have been torn down. Now about two-thirds of the sediment that would have gone into the containment site is being recycled for other uses, said Jade Davis of the Cleveland-Cuyahoga Port Authority. That, he said, will extend the life of the containment site by at least 20 years. With two years to go before the ban on dumping silt into Lake Erie takes effect, the Ohio EPA says it has a plan how to better use the sediment from the remaining seven harbors — the biggest amounts coming from being Toledo, Sandusky, Huron and Lorain. “We don’t want to find just another place to dump it,” said David Emerman, who is overseeing the state project. Instead, the sediment will be used to create wetlands along the lakefront, applied to farmland and low-lying fields and turned into marketable soil can be used at construction sites or sold at nurseries, Emerman said. One idea being looked at is building a series of wetlands near Toledo and in Sandusky Bay. The wetlands would act as natural filters for water draining into the lake and could help reduce the type of contaminants that feed harmful algae. They also could have hiking paths and benefit wildlife and outdoor recreation, he said. The biggest hurdle will be dealing with the huge volume of sediment. There’s enough dredged from Toledo’s harbor each year to fill 70,000 dump trucks. “It’s a challenge that, I think, is meet-able,” Emerman said. 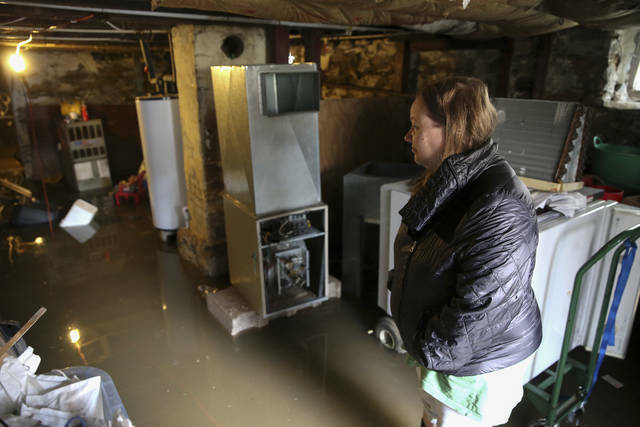 Colleen Finnell, of Bellevue, Ky., surveys the damage of her flooded basement her Ward Avenue home, Sunday, Feb. 25, 2018. 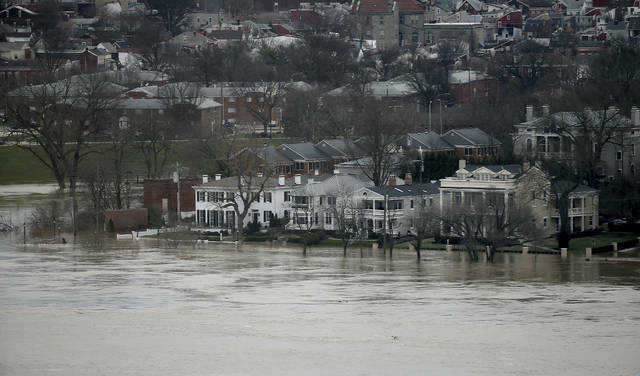 The Ohio River is expected to crest at 60.7 feet by Sunday evening, according to the National Weather Service. The river rose above the 60 feet mark for the first time in two decades Sunday morning. https://www.sunburynews.com/wp-content/uploads/sites/48/2018/02/web1_119950600-f1b63cb390a7475aaa4c5d3739a5f6d5.jpgColleen Finnell, of Bellevue, Ky., surveys the damage of her flooded basement her Ward Avenue home, Sunday, Feb. 25, 2018. The Ohio River is expected to crest at 60.7 feet by Sunday evening, according to the National Weather Service. The river rose above the 60 feet mark for the first time in two decades Sunday morning.